Here is a great example of creative mashup using randoms – street strangers – who were each given a violin (probably not a real strad!) to play briefly as well or as poorly as they might. The sounds were then sampled and remixed into a haunting track. A great piece of community art/music. I carefully scalloped out the inside of the top and back using the arbortech woodcarver in my angle grinder, then used a small sureform curved shaper and then a scraper to smooth out the inside. Then I thinned the boards with the planer thicknesser, taking care to check the thickness between each pass to ensure that it didn’t break through into the concave portion. I used a forstner bit to cut the two round sound holes and shaped the convex surface with the wasp belt sanding attachment mounted on the drill press. There is still some way to go yet, but the shape is emerging in a fairly satisfactory way – I suspect there will be a couple more evenings of shaping before the top is ready to fit onto the ribs. Is blogging a form of busking? Since starting this blog I have been observing the statistics to see if a single-topic blog would attract more readers than a scattered journal-like blog. What has struck me is that, not only has this blog grown much faster than my Mindsigh one on Lostbiro, but that the stats also provide immediate (okay within a day or so) feedback on whether or not a particular kind of post works better than others. So what has this to do with music? Well, just like McDonalds is more about real-estate than fast food, so too, blogging is more a form of busking than journalism. How would I know? About thirty years ago when I was learning to play fiddle I campaigned in Adelaide to get busking legalised – and when it was I received busking licence number ten. The thing about busking is that it is one of the best (and most brutal) ways to learn about performance. I learned about making eye contact with an audience, and about the use of movement and gesture, and about how to structure a performance. All of this stood me in good stead when I subsequently became a full-time musician and my journey into the album charts. Even today the way I work an audience is a direct consequence of what I learned as a busker all those years ago. 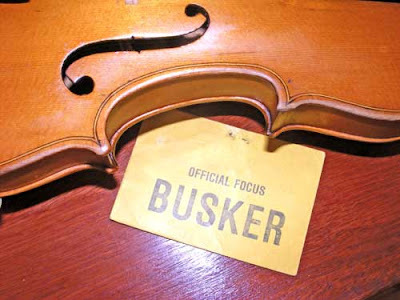 Busking gives you direct feedback – people either stop to listen or they don’t. And people either give you money or they don’t and it depends directly on whether or not they like what they see and hear. It is a brutal school in which to learn, but it is also brutally honest. The feedback is continuous, immediate and above all, honest. The audience has no stake in my performance other than what attracts them at that moment. And I met some amazing people. One violinist gave me an impromptu lesson that improved my tone forever; one evening Itzhak Perlman played my fiddle for an amazing 20 minutes when the Israeli Philharmonic came to town. So the rewards were not always the financial ones. Back to blogging – the stats show day by day how many people came by, what search terms or tags brought them there, and which posts they open. If I fail to post the stats go down. If I write a boring post the stats go down. But if I post on a popular topic (or a curiosity, like pochettes) the readers come by and have a read. And sometimes they leave a comment – like dropping a coin into the fiddle-case. Piece by piece, post by post I’m learning to write a blog, finding my audience and understanding more about the process of writing as a kind of performance. Once the glue had dried I removed all the peg clamps and used a pencil to draw around the outside of the ribs onto the material for the back. 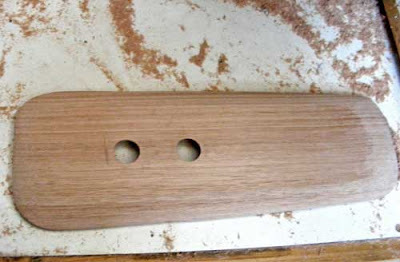 By keeping the pencil flat to the ribs this means that the line would allow a little overlap beyond the ribs – this will help to protect the ribs from knocks when the fiddle is assembled. 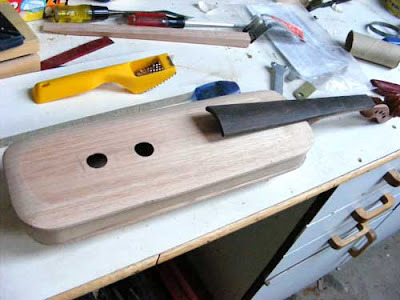 After cutting out the shape roughly with the hobby bandsaw I set it in the vise and positioned the hollow rib frame over the board. Again using a pencil I roughly outlined a dish shape inboard of the blocks and leaving a little margin for the edges so that there would remain a flat lip for gluing the back to the ribs. Using great care and loads of protective clothing – canvas apron, earmuffs, dust mask, visor and gloves I gently scalloped the dish out with the Arbortech Woodcarver blade mounted in a standard Ryobi angle grinder. And I mean gentle – that blade can take off a load of wood very fast if you are not well braced and well balanced on your feet. Then a bit of leveling with hand chisels and finally dressing with a curved scraper. This latter is a wonderful tool that gives great feedback and you can scrape along or across the grain with impunity. By the end of the evening I had the first phase of the back almost done. 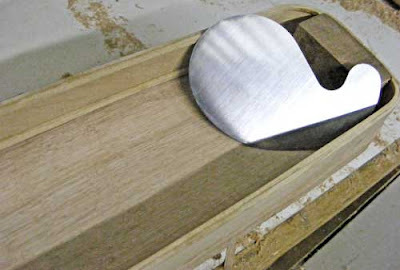 The next thing will be to thickness it down a little and then shape the convex surface close to the interior contour. The wood already has a ring to it – it’s amazing how you can hear the acoustic properties change as the scraper is drawn along the timber. Russian lawyer and musician Maxim Viktorov has paid a new world record price for a violin – a Garnerius ‘del Gesu’ for an undisclosed sum in excess of the US$3.93m paid for a Stradivarius instrument. The instrument, dating from 1741 was at one stage owned for 15 years by Belgian composer Henri Vieuxtemps. A US$1m Guadagnini violin was in the case that broke the fall of violinist David Garrett, not a Stradivarius as reported by the BBC. Giovanni Guadagnini was a student of Antonio Stradivari and also made excellent instruments. The 190 year old violin suffered extensive damage with several large cracks and even the soundpost was split! Luckily the damage is repairable, but it will be a lengthy restoration, expected to take around eight or nine months. This BBC article describes the repair process. 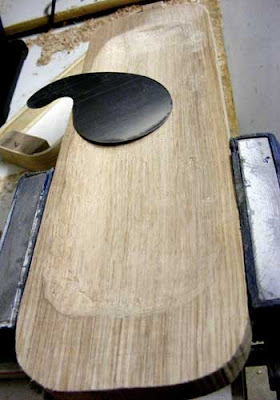 Every sliver of wood will be accounted for and painstakingly glued back into place in a procedure that can be likened to modern day keyhole surgery. 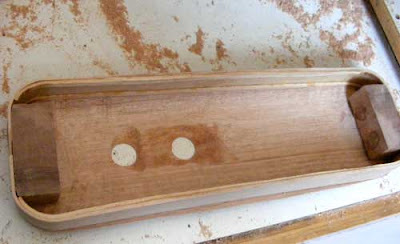 An endoscope has been used to survey the damage from the inside without dismantling the violin. Repairs are expected to cost around $120,000. In the meantime, Garrett will be loaned a 1718 Stradivarius violin to perform in London this week. There is no doubt about the talent bursting from this 26 year old former child prodigy – the youngest musician to have been signed by Deutsche Gramophon.